The genetics testing company helps Gru find his lost-lost brother in six-week marketing push. The stars of the blockbuster "Despicable Me" movie franchise, the popular pill-shaped yellow Minions, have pitched everything from Amazon to Twinkies. 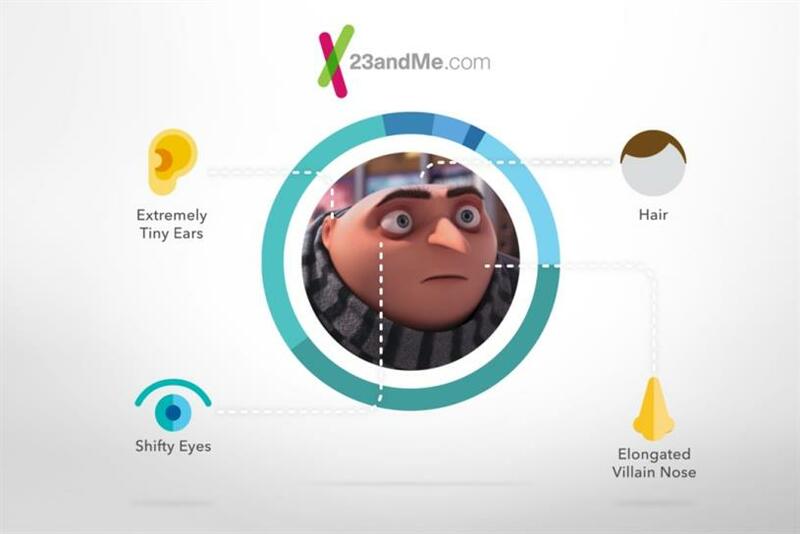 This week, their evil overlord Gru is taking a starring role in an advertising campaign for 23andMe. Borrowing from the main plot point of the upcoming release of "Despicable Me 3," a 60-second commercial titled "Genetically Me" features the supervillain finding family through the results of his DNA analysis. In the film, Gru, voiced by Steve Carrell, discovers that he has a brother, but not through 23andMe, as depicted in the ad. In the Illumination Entertainment production, the character learns about his sibling through a stranger. 23andMe teamed up with the $1 billion franchise for its first movie partnership in order to raise awareness about the brand and DNA testing, said the company’s Director of Brand Marketing Becky McIntosh. "Personal genetics is a new and growing category. As a brand, we’re tasked with not only building our brand and selling our product, but also building the category and explaining to people what it is, what they can get from it," she said. The ad, created by Los Angeles agency Haymaker, will appear on national cable television and also be distributed in various lengths on social media. The ad directs viewers to a special section on 23andMe’s site to explore the character’s results. He’s 84 percent European as well as a light sleeper (or it could be the fact that the Minions keep him awake, the site says) and has inherited an "elongated villain nose." The six-week campaign will also include banner ads and a billboard in Times Square. The movie-tie in is running alongside 23andMe’s two-year-old "Incredible You," campaign, from R2C Group, which highlights how the company can help consumers find and tell their unique stories. While the $199 Health and Ancestry service includes risk assessment of developing diseases like Alzheimer’s and Parkinson’s Disease, "Genetically Me" keeps Gru’s results lighthearted, focusing on health topics like Gru’s hair loss and lactose intolerance. "We thought it was a unique way to show our product and the discovery that people go through in learning about their genetics through a really well known and accessible character like Gru," said McIntosh. "We feel like science is for everyone, and this was a way to make it very accessible, take the intimidation factor out of it." Although McIntosh declined to comment on future advertising plans, she said to expect more from what she calls "a scrappy start-up," which spent $12.6 million in advertising last year according to Kantar Media. "We’re constantly trying to get on people’s radar screen," she said. "With a price point as it is, it’s not an impulse purchase, so you do need to be in front of them with different aspects of the product."